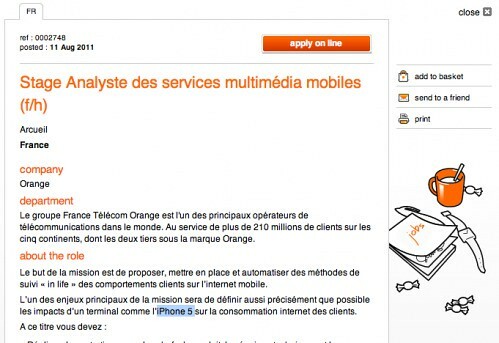 Nimbuzz points us to a Orange France job description which seems to indicate that an intern will be studying the impacts of an iPhone 5 on consumers’ use of mobile internet devices. * Comparison uses VoIP / IM on all the solutions available on the market: Skype, MSN, Gtalk, yahoo, but also, Fring, Nimbuzz, Viber, Tango. Fluent English is a requirement so if you are reading this now and in Paris, you know where to go.